It was so unexpected that I didn’t even realize when it came – burnout. It may very well be the case that I need a vacation since this summer has been quite hectic. It wouldn’t hurt to prioritize all the tasks and projects on my to-do list to make my work plan more realistic and reasonable. But there is also this nagging feeling that seems to contribute to my burnout, which I suspect may not be easily cured by a vacation or a re-prioritized work-plan. Despite my two years of experience as a professional librarian, I have doubts about what a librarian should be and questions about who I am as a librarian. The fact that librarians do so many different things and yet can be all called “a librarian” doesn’t help dispel my confusion. What do librarians share other than the fact that they all work at a library building and somehow contribute to a library’s daily operation and they all went through the MLS program at one point? What a cataloger does is so different from the daily work of an instruction librarian just as the work of a web services librarian doesn’t overlap at all with the everyday work of an inter-library loan librarian. What ties these individuals together as one group – a group of librarians? 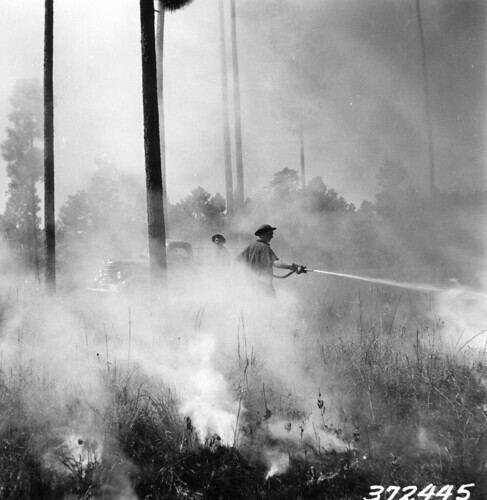 Fire hose turned on the fire by Oregon State University Archives on Flickr. I know this is a trite answer. But it seems to me that the family resemblance of all librarians, to borrow Wittgenstein’s term, is not so much the nature of individual librarians’ work as a shared belief and faith: the belief that information and knowledge is to be treasured and someone must work to deliver and preserve this information and knowledge accumulated throughout human history to the public, the faith that access to information and knowledge is a basic human right and it should be equally provided to anyone who desires to learn. If someone asks what I do and asks again what that means when I reply that I am a librarian, this is the answer that I should give rather than enumerating all the mundane things like setting up e-resources for a trial, filling out the paperwork for my grant project, updating web pages, and going to lots of meetings. The problem is that this belief and the faith that are at the core of librarianship are often lost to a librarian’s view who has to battle with bureaucracy, red tapes, indifference, and often the lack of understanding, support, and recognition, in order to get seemingly the most mundane things done. But at heart, librarians are ideologues and dreamers, ideologues who do their legwork, dreamers who do act upon their dreams, sometimes to the degree that leads to the loss of the sight of their collective identity. I always loved librarianship because of its practicality. But making the practicality coexist with the belief, the faith, and the ideology of librarianship side by side is not an easy task at all. I have turned to librarians on Twitter for advice and have received 17 amazingly wise and helpful answers ranging from the suggestion of a new author to read and the recommendation of a hearty portion of ice cream and chocolate to the quite sound advice that I could be digging the ditches instead (quite true!). I am sharing them here for other librarians suffering from burnout like mine. depends on source of burnout;often reading profl lit recharges, other stuff (leadership lit 4 me) to reconnect. &convos w/ peeps. think about what u can let go of that isn’t interesting or v. important. Keep working on at least 1 thing that is exciting to u. @ranti Vacation? What’s that? That’s the weekend, right? Find someone with a diverging viewpoint about what I do or am passionate about (metadata). Gets the juices running again. take the vacation time you get and use it for non-work/library stuff. have hobbies & interests outside work. Hang around positive people. Make our home a sanctuary. Also, I take responsibility for my choices. And Cats. And Chocolate. I always try to keep looking a different things…If I spend too long on one thing I tend to get bored and tired!